There are many stories of saints in the Orthodox world, including contemporary ones. Their biographies are sometimes remarkable, sometimes not. Their stories are occasionally marked by miracles, but not always. I cannot think of a single characteristic that makes them like one another apart from their sanctity. And that quality does not make them so much like one another as so completely and truly themselves. I have had occasion to be with a saint on at least three occasions. Mind you, this is my opinion since none of the three are canonized. Two of them are still living. The third has just been revealed to be incorrupt four-and-a-half years after burial. And in this last instance, the saint would not necessarily have been recognized as such by most people who knew him. But there is an experience of the three that I find strikingly similar. It has to do with the experience of presence. CS Lewis in his novel, That Hideous Strength, describes the experience of being in the presence of the Eldila, angelic beings who govern various planets. When in the room with them, space seems to tilt, they themselves are the moment and measure of balance and things become relative to their presence. That is perhaps an odd image to draw on to speak about the saints, but it’s pretty much the closest thing I can think of. I do not mean to describe an experience that makes you dizzy (although I did almost fall down once while leading an Akathist to the Sitka Icon of the Mother of God). Rather something about their presence changes the balance of everything around them. I should add that this same experience brought with it a great sense of well-being. I do not believe such things to be objective, but neither do I think they are purely subjective, i.e., merely in the mind. Instead, I would describe these experiences as personal. And I must be clear, I mean personal, though not private. I am saying that it involves something that in theology is described as the person. The Elder Sophrony makes very clear in his writings, that although we are created as personal beings, our personhood is something that is becoming. We are moving towards the fullness of our person. The fullness of who we are is something hidden, something that shall be revealed. What I believe I have experienced, in at least three people of my acquaintance, is just such personhood in its greater form. I find it interesting that a prayer in the Book of Common Prayer refers to life in the age to come as “the larger life.” I have always thought this to be a very apt description, though I do not know its origin. But it accurately suggests something that I believe I have seen. I will not speak of two of the persons who fit this description. They are both quite alive and well and it would be inappropriate. However, the person of my late Archbishop (Dmitri of Dallas), is another matter. I knew him as kind and generous. I also knew him well enough to be aware of his limitations. But when you were with him, there was simply a wholeness about things. And that wholeness made the limitations seem unimportant (as indeed they were). What I knew in him was the fullness of a bishop. In our diocese we describe him as the “Apostle to the South,” and I think it is a title that will eventually be his canonically. Things happen around saints. God “causelessly causes,” and we cannot ever quite put our finger on the “how” of it. The same was true in our diocese. Founded in 1978 with a tiny handful of parishes, Vladyka simply being the living force around which parishes “happened.” I once heard it said (in a derogatory manner) that Bishop Dmitri would “start a Church anywhere he could find two old ladies and a cat under a tree.” When I was received in 1998, that was a pretty apt description of our mission and many others. We were a diocese of worker priests and storefronts. But what seemed quite grim to me at the time simply “happened.” Today storefronts are rapidly being replaced with beautiful temples and most of the priests are full-time. The diocese is a model to the Church in its health and finances. And it cannot be said that Vladyka “managed” all this. It wasn’t managed: it was planted, nurtured and grew. It has been like the Kingdom of God. What I have slowly learned is that what I am describing is simply grace; and in a living saint, the presence of grace manifests as Person. The Kingdom of God seems to occur mostly in our peripheral vision. What is causelessly caused can be seen by everyone, but its Cause seen by none. In August of 2011, the Apostle to the South fell asleep in his home in Dallas, next door to his cathedral. This past weekend, his faithful children brought him home to his cathedral as his body was transferred from its temporary grave in Dallas to a newly constructed chapel built for his crypt. His body, unembalmed, was found to be incorrupt. The Cause of that will not be seen, until we see God face to face in that larger life to which we are called. God is wonderful in His saints. Thank you Fr. Stephen, wonderful post! “The Kingdom of God seems to occur mostly in our peripheral vision.”. I think this is most true about the Saints, especially those who we might now in this life still…. When we meet them, we sense their holiness and sanctity with our ‘peripheral vision’…. God is truly wonderful in His Saints! I couldn’t help agreeing with your words once again Father. Having been gratuitously blessed to be in the presence of Saints, I especially agree that each one had something entirely different from the other, yet it was so unforgettably transformative that it could only be described as “of God”. One would, leave a lingering fragrance of prayer in your heart, another instill a grace-filled joy (just by looking upon his countenance) which you could never forget (although you would certainly forget all your problems in his presence! ), the other would transmit a lasting ‘fire’ in your heart which you could bring back to memory by remembering his face, another something else… Glorified is God in his Saints! Thanks for writing about Archbishop Dmitri. What you write reminds me of how I was introduced to the Orthodox Church: by reading a book called “Everyday Saints and Other Stories”. I read about people who lived and expressed the fullness of Grace that you write about. As a Protestant and an American, my heart was filled with hope when I realized that there were people – in this century! – who *are* Christ among us. Today – faced with my own many weaknesses and shortcomings, I am grateful for their example. I am also grateful for the Elders in my life who lend strength to me, who know how to suffer their own weaknesses well, and who guide me as I learn how to do the same. I truly believe that the Presence of Elders and Saints is one of the most important characteristics that distinguishes The Church from a social club or a gathering of well-meaning people who do good things. I think that as the days get a bit darker in our country – we will come to realize the necessity of their Presence. “Our Orthodoxy has to do with belief in the One God in Trinity, Whose nature was uniquely revealed by the God/Man, Jesus Christ, the Eternal God Incarnate. Thank you, Father. Perfect piece for this sobering and sanctifying season. I have been struggling to articulate some things in some of my poems. Sometimes, there are no perfect words, just the best words we can come up with from our feeble hearts. Many thanks, Father! I was unable to go to the temple for his re-internment but have conversed with several people in our parish who went. They are already referring to him as a Saint and I have heard nothing but wonderful stories of his person and impact in the lives of those he encountered. Glory to God! What a wonderful description of saints! The last 4 years of my Anglicanism, my family and I attended a pilgrimage at an Orthodox monastery each year, at which Vladyka was present and presided over a weekend’s worship and activity. He was surrounded by priests, monks, nuns, and the faithful and was always, always, simply delighted to be with them. He never seemed to tire, though he was older than us all. But neither was he a personality that had to be the center of things. He was simply comfortable with us and made us comfortable with him – and with God. A recall one session in which we were all gathered around him, discussion was flowing, largely moderated by him, and primarily directed by questions placed to him. I was just an interested Episcopal priest. A question was asked and he looked at me and said, “I think Fr. 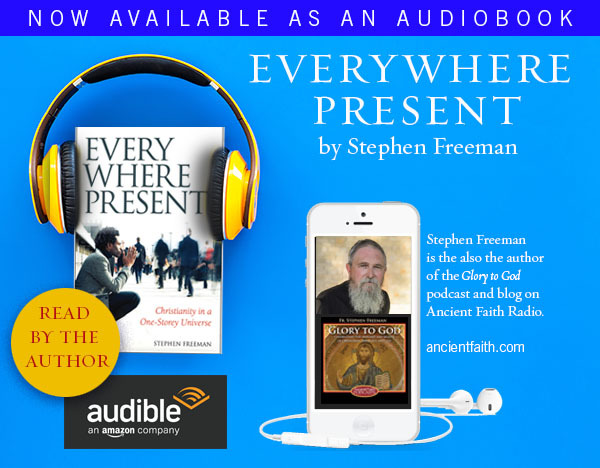 Stephen could answer that better than me…” I was completely overwhelmed. I managed an answer, but came away astounded. His kindness and respect and what can only be described as an act of profound kenosis struck me to the core. As someone who never got much of anything but scowling from my Episcopal bishops, being treated as an oddity and a fly in the ointment, to find such fatherly care and respect when I was not even Orthodox was beyond my expectation! It was the opposite of an “ego-thrill” for me. It put so at ease and comfort, that my ego didn’t need anything. I knew I was look at the face of my home. It was a robe, a ring and a fatted calf. But I also know that my story is not unique – that many, clergy and laity alike, had such deeply personal encounters – some of them without so much as a word. My parents were deeply struck by him. This is what I mean by “peripheral vision.” You come away changed, but mostly only notice it well after the occurrence. 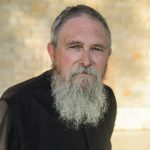 When I look back at my experience at the monastery, I can see that I was probably nurturing a great sense of shame – as an outsider, one who didn’t belong, either to the Orthodox or to the Anglicans – and a single action covered me. I daresay there was nothing conscious about it. It’s just how he was – always and everywhere. Everytime I heard him speak, I came away deeply confirmed in the Orthodox faith. In hindsight, he mostly said the same thing every time I heard him speak. It was like the 7 Councils with a voice and a face. And it was always winsome. He could be a problem. I remember picking him up at the airport one time. We went down to baggage claim and I was looking carefully for his luggage. When I found it, I turned back to him and he was missing! I found him a few minutes later. He had wandered off and was engaged with someone, talking warmly about the Orthodox faith. He was always a gentle, loving presentation of the gospel. He especially loved language – particularly Spanish. You could easily lose his attention if you encountered a Latino in a restaurant or elsewhere. He would immediately fall into conversation with them. He was the Exarch of Mexico for a while and loved it tremendously. I’ll ramble on like this with stories…and I did not know him nearly as well as many others – particularly the faithful in Dallas. I am so glad he is home. I too like your description of the Kingdom of God being in our peripheral vision. Its hard to see Grace working when one is immersed in the on going stream of events, but it certainly stands out in stark contrast when viewed in the perspective of hindsight. What else but Grace, working through a good and faithful servant, would have ever created the Diocese of the South in the relatively few short years since the work began? I was not there in the beginning nor did I ever have the pleasure to meet Arch Bishop Dimitri, but I can see the fruit. Glory be to God. Truly God is wonderful in His Saints! Sharon, “Everyday Saints” is one if my favorite books, too. My response to it is as you describe as well. What wonderful stories, Father. The wandering, the love for Spanish, there are so many parallels to other Saints, but none exactly similar. My personal experience of saints I think was at Mt Athos. At times it was an overwhelming sense of joy and loss of sense of time and space. Another time it was an inexplicable, and since or before unique, tachycardia. It happened when I visited the Icon of the Theotokos “Axion Esti”. These figures of Orthodoxy completely removed all earthly concerns from my mind while I was with them. My two fellow pilgrims also reported similar experiences, although we all felt we were granted what we needed – and that was personal for each one. I have no way of knowing whether these monks were saints or not. It didn’t matter at the time; they were out of this world and still are a calling to a world outside of the senses. Perhaps they do have something in common: a complete and absolute faith in God. And they look so happy all the time! I spent several years among charismatics when I was a young man, and it left me very jaded on the topic of experiences. There was such a surfeit of outlandish claims that were largely just emotional issues, etc. I was rescued from a sort of despair that could have led to a very dark path primarily through reading of the Orthodox saints (particularly Russian ones). Greek hagiography is, to my reserved English nature, too overstated and emotional. The rather severe treatment of the topic in Russian writing suits my temperament better. So, I’m not one to point to experiences when I speak of how my faith is grounded. However, there is this experience of the saints that I mentioned, as well as a few encounters with icons that are simply “not-of-this-world.” And I say that as someone who actually has a very skeptical temperament. This “largeness” is especially strong for me. I have hopes to get to the Holy Mountain soon, and perhaps to Russia after that. As God wills. Thank you Fr. Stephen. You gave words to something I might have caught a hazy small glimpse of. The experience of the *person* reminded me that “where two or three are gathered … .” Perhaps the presence is the fuller presence of the life in Christ, the self given by Christ, participating in Christ. This understanding and description of person is very highly developed in the writings of the Elder Sophrony. He says that we are in the process of becoming true persons (hypostatic existence). God exists as Person (3 Persons), and we are created to, but do not fulfill that as of yet. We are moving towards what that means. It is a major theme in his writings and teachings. I think it is what I have experienced in these few encounters. It is indeed something to ponder. I believe that true hypostatic existence (personal existence) has a way of drawing others towards the same sort of existence. It is what is meant in “beholding face to face.” In the presence of Jesus, Simon is revealed to be Peter, etc. An adulteress becomes a new person. Etc. That becomes a key question for us in prayer. That we move towards Him and thereby find ourselves. Father Stephen, when I first read the news about Archbishop Dmitri on AFR’s Facebook page, I waited with great anticipation for you to blog about it, because I knew it wouldn’t be long before you’d have such a wonderful perspective on it! When I first read about his passing, and all the wonderful things you and everyone else who knew him said about him, I found myself weeping. Mourning his loss, but selfishly even moreso because I never knew him (I’ve only been Orthodox for 5-1/2 years, and I’m in Western PA, so there’s no way I ever would have met him). After reading this post, I’m weeping again – for the same reason. Father, is it proper to distinguish between “experiences” which can be anything at all and ate sometimes instructive and encounters which are deeply personal as you describe you on going encounter with Vladyka. I have encountered two people such as you describe. For me it was as if both the world around me and my own heart was enlarged. Then their the hidden saints known only to God who I think may be far more common than we realize, at least I hope so. Beautiful! (Truly, eh?) And that opens up a long road of mystery I think, so many possibilities. Thank you Father. This might seem like a strange thing to say but I feel as though I have met saints through books. Of course, I have been inspired by saints, reading things that they have written or things written about them. But this is something different. There have been a few (from both eastern and western Church) where I actually feel I developed relationships with them after encountering them in books. Like you, Fr. Stephen, I am not one for dramatic “experience” or imagination in my prayer life. One such encounter was with St. Paisios of Mount Athos, before he was canonized. I felt compelled to obtain his biography by Elder Isaac even though it was out of print and more expensive than others. The book felt “holy” to me when I first touched it, even before I began reading it. I felt a deep connection with Elder Paisios through the reading of the book. I prayed for his help with a particular patient of mine – a young person – and something quite amazing occurred that quite possibly prevented a suicide. This is particularly interesting to me because I know that during his lifetime the Elder did not think well of Catholics. Nonetheless, I felt drawn to his unmistakable holiness and perhaps he, having become fully himself in Christ, now brings help and healing to us poor Catholics as well. It’s interesting that you say that, Mary. I felt a similar attraction to the same book and to the person “inside” it. Thank you, Fr. Stephen. This post expresses beautifully my experience of him as well. I have felt connected to Saints through books about them as well; most particularly Saint Seraphim of Sarov. I first read about him in The Mountain of Silence, the book that introduced me to Orthodox Christianity. I believe that Saint Seraphim actually brought me to the Saint Seraphim Church in Santa Rosa, CA where I was later baptized into the faith. I wandered away from the Church for while, but Saint Seraphim again brought me back home. I am now reading the biography about him written by Lazarus Moore, through which Saint Seraphim continues to inspire me at a very deep and profound level.